After having fun reading many of your blogs, I have decided to add my name and business to the blog community!! 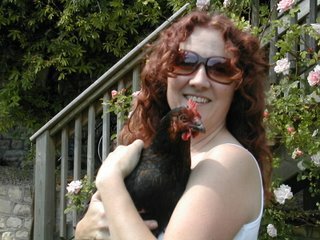 My name is Niki and I live in Somerset in the UK, with my lovely husband Dave and our three gorgeous daughters -and our six hens! I have run my small business for several years, selling items I have made myself from vintage fabrics and also other items with a nostalgic feel, at local Antique Fairs and on my website: www.nostalgia-stonehouse.co.uk Hope you can find the time to take a look! My loves include; (after my family!) -French vintage items- (think I was French in a past life! )- such as the fabrics, (Old toiles, checks and florals...), enamelware, mirrors, painted country furniture and those quirkly items that could only be French! I collect the old fabric covered glove boxes too and store all my buttons, lace etc. in them. They display well, all stacked-up on my painted cupboard in my workroom. I love spending any spare moment sewing or being creative in other ways. Making my rag dolls and bags is great fun- each time they are a one-off, so I never get bored. Decorating or adding to my home is also something that I enjoy- will it ever be finished?!! We have done a tremendous amount to our 1930's house,(It's not Deco, though), making it a joy to live in. It is practical, but pretty, too! Visting flea markets, antique and vintage fairs, salvage yards, junk shops and jumble sales is my idea of a good time! You never know what you may find- it is usually a unique treasure though! My garden gives me great pleasure. My chickens have the run of it, so it doesn't always look it's best, as they love to scratch for worms, but I wouldn't be without them and they reward us with golden yolked eggs every day. 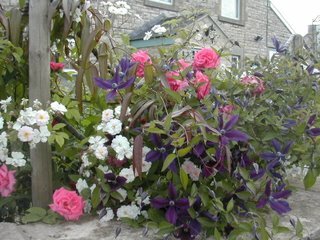 My favourites flowers are my roses and the big lilac tree that scents the air in May. Guess you could say I am a country girl at heart. Finally, to end the day, what better than a hot bubble bath and a copy of 'Country Living' magazine or Rachel Ashwells 'Shabby Chic' book to relax and dream with??!! We too have chickens. Aren't they the best? Hi Dons, Thanks for leaving a comment on my first blog! I can see that we have so much in common. I will enjoy reading your blog and will check in regularly! June 2006! Where has the time gone?